Elimination Diet, Day 13 (Phase Three, Nightshades) – With Recipe! Day 13 is traditionally when one would test tamari on this Elimination Diet. However, I had never even heard of it before I started this diet. Therefore, instead of seeking out recipes to try to for the first time and test something that couldn’t possibly cause my eczema, I have decided to move on to Phase Three and test nightshades (tomatoes, potatoes, eggplant, and peppers). If you want to add back in apple cider vinegar (but not other vinegars), you would do so in Phase Two. To make the addition of nightshades easy on me, I decided to add in tomatoes on the first day and potatoes on the second day. The third day would be a mix of nightshades (I don’t like eggplant and don’t eat a lot of peppers). 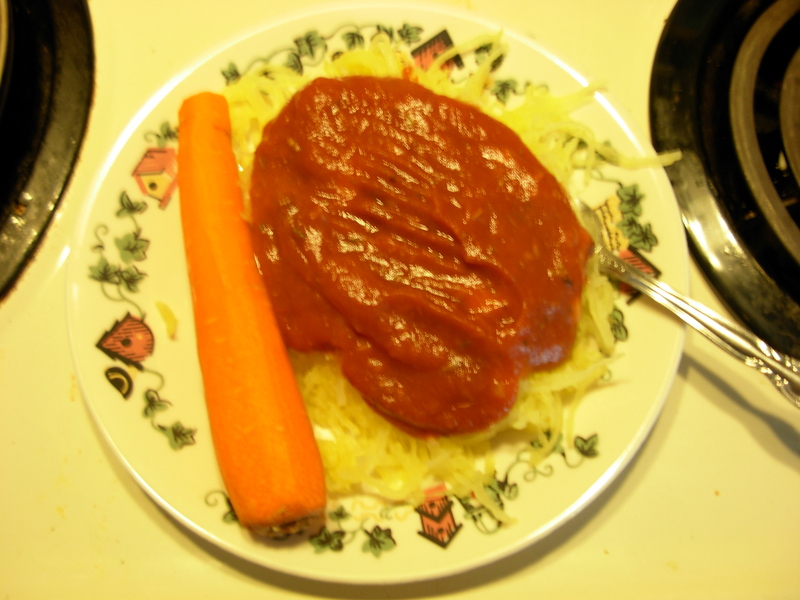 My first meal was going to be tomato sauce over spaghetti squash. So excited! But commercial sauces have sugar, “flavoring” (why do you need to flavor something with tomatoes, sugar, and herbs? ), and preservatives. Canned tomatoes have citric acid and calcium chloride. I don’t know much about those additives, so while they are likely okay, I want to avoid them if possible. Possible! For one, I could have made sauce from fresh tomatoes. But I wanted to save those. As it turns out, the tomato paste in our house is nothing but tomatoes and can be made into a sauce. It is very simple and tastes great. Combine all ingredients in a sauce pan and mix well with a fork or whisk. Heat over medium to low heat. Serve and enjoy. Stomach felt strong after the tomato sauce, but it talked a bit after my afternoon snack. Could be from the sauce or the sweet potato chips. I’m sure I have some sort of gut healing that needs to be done in addition to my skin healing. But right now things are going so well with my skin. I’ll worry more about healing my gut after this. Skin was looking very clear today. Not perfect, but today was one of the best days. Then I went to karate. During the workout, my arms started to hurt so I pulled up my sleeve. Huge eczema breakout! By the end of the night it was on my legs, too. Looks like I have a problem with tomatoes. If it completely clears up by dinner tomorrow, I’ll try a baked potato. Otherwise, looks like nightshades are out for the time being. Something interesting my step dad told me is that he knows people who only have issues with the seeds, not the rest of the tomato. That will perhaps be something to check down the road. Right now, though, I’d rather just keep working my way through this diet. Dinner: Split Pea Soup (Whole Life Nutrition Cookbook, page 156); I replaced the pepper with tomatoes and omitted the vinegar. The tomatoes basically disintegrated, which I liked. I also found that a teaspoon of cumin wakes it up a bit and gives it interest without really altering the flavor. Fermented vegetables on the side. Made an apple pie for breakfast tomorrow. I wasn’t sure about this initially, since it would be a starchy potato day. Since my break out, though, I’m excited for something that smells so good. I had some apples left over, so I saved them to put on quinoa later.